Sure, the previous winter may have been mild, but can you really afford to postpone your radiator replacement any further? If this year's capricious weather decides to strike in full force, you will need to have a suitable answer. An answer that Fantastic Handyman is more than able to provide. From replacing radiator valves to mounting modern electric radiators, the precise and seasoned experts will do whatever it takes to help you maintain comfortable temperatures in your home. 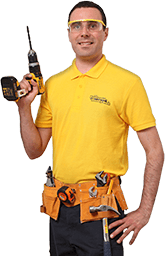 Every handyman that we send to your property is completely qualified and has years of experience in fitting radiators of any shape or size. Whether their job involves mounting an electric fan to a radiator, fitting radiator brackets, or performing a new towel radiator installation, the knowledgeable technicians will always abide by the latest British Standards and will closely follow your personal preferences. Just name what needs to be repaired or replaced and the efficient and multi-skilled professionals will get it done in no time. Besides helping you with installation of radiator valves or vertical electric radiators, the pros can also assist you with just about any home maintenance or fitting task you can think of. Some of the odd jobs they can readily complete include fitting of new doors, installing modern security systems, unclogging sinks, repairing leaking pipes, and much more! Regardless if you want us to change a faulty valve or install a row of fancy wall mounted or portable electric radiators, your final radiator installation cost will never exceed your budget. That is because our rates depend on the actual time it takes to get the job done and not on already pre-determined price tags. There are also no concealed fees or deposits, so you can always be sure that you are getting your money's worth. Booking an electric radiator installation session will take you less than a minute. With Fantastic Handyman, you have the complete freedom to choose and which repair or installation jobs needs to be done first. Once you have those details down pat, get in touch with our friendly, round-the-clock advisers by either logging in our instant chat platform or filling in our online booking form. You can also download the free GoFantastic app to quickly manage our rich selection of life-bettering services (25+) with only a few casual taps!